On the job motor vehicle collisions are as prevalent as ever. It is essential for employers to emphasize on-the-job driving safety. In the past two years, motor vehicle crashes have increased 14%. “That is the highest increase over a two-year period since 1963. More than 1,000 people are suffering from life-changing injuries. We also know that the number one cause of on-the-job deaths are motor vehicle collisions,” said Jenny M. Burke, Itasca, Illinois-based senior director of advocacy at the National Safety Council. The major reason for the increase in crashes is the distracted driver. 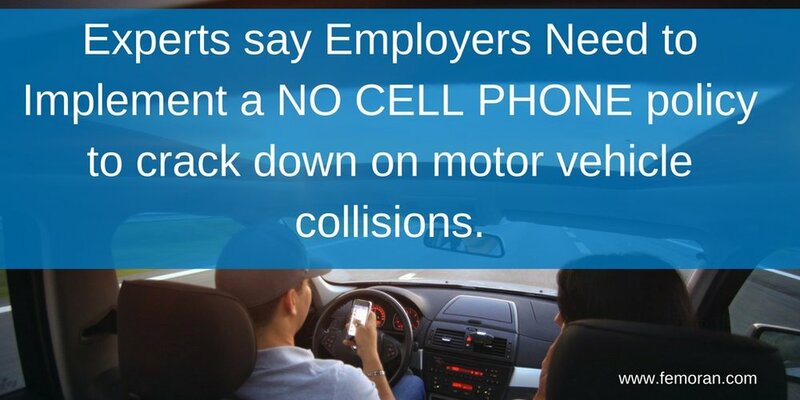 In a survey, 79% of people said that they would make phone calls while driving if it were legal. Another 53% admitted that they would text while driving if it were legal or that they already were. Exxon Mobile, Shell Oil, and Time Warner have implemented a no cell phone policy. Experts say others should follow suit. Read more at Business Insurance.